Hi my name is Kristian I'm 33 years old (young), I live in Finland and got my first bug when I was 14 years old (we get the driverslicence when we are 18 in Finland). It was a so called "junkyard racer". I lived in the countryside so we had a lot of small dirtroads to "race" on. This project got its fire started way back in 1984 when I saw the first pictures of the Hebmuller roadster. I've always been interested in old VW beetles and when I finally found the remains of this early -52 split window I just saw it coming. A HOTTED HEBMULLER. Yes I don'n care what the vintage restorers say: "If you go through such much trouble getting original parts to make it original on the outside, why don't you just make it original??" There's one simple answer to that: I don't want to do that. The split had been unregistered in 1967 and used for reserv parts in other words it was stripped clean. Even the rearwindow had been "saved by a callook freak" many years before me. Luckily the former owner did find the clock for the dashboard. The car is based on the split floorpan (or the remains of it) and the front and dashboard of the same. This just because in Finland the registration of a car requires the frame and framenumber to be original to get the identity. The heaterchannels I took from a -63 body and strenghtened them with cabriosills. The rear quarterpanels and doors are from a -64 body. (What a mess.. ) No, I've got the most parts together now. the next step is to start on the decklid.. I have two front hoods and one pre-52 decklid to work from. I'll get back as soon as I start to have something to tell or show..
Added a side view picture. Last edited by Hebster52; November 9th, 2006 at 09:02 AM. Sadly I have'nt had any major progress on my Hebster because we are building our new house. During the time we were building the house I've been collecting some parts for it. The latest investment was a Karmann cab frame that I will modify (shorten and chop) to fit my Hebster. Last edited by Hebster52; June 27th, 2006 at 11:05 AM. Finally got the Split -51 home!! Last edited by Hebster52; June 27th, 2006 at 11:06 AM. 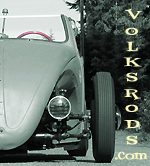 I've created a group in the Yahoo where I collect all kind of pictures regarding special bodied VW's and my other hobbies. So all you Yahooers feel free to join in. Last edited by Hebster52; June 27th, 2006 at 11:07 AM. Finally uploaded my own Homepage on the Net. Last edited by Hebster52; June 27th, 2006 at 11:08 AM. This is what I bought in stead of the Choptop. A 1963 Standard beetle. A Standard beetle means that it doesn't have any chrometrim on the sides, the bumpers are painted, 40's threespoke steering wheel, "crash-box" non-synchromesh gearbox and a lot of other details on early models only. It is going to go thru a body off total restoration. ( floors and heaterchannels probably needs to be changed). I have not yet brought it home for closer inspection. The interiour will just get some minor fixing and cleaning. And finally "my little helper". Last edited by Hebster52; June 27th, 2006 at 11:10 AM. Now, lets update The Hebster with some pics. Here the original 1952 floorpan and is finally put together and sitting on its own wheels again after about 35 years lying on the belly. In front I have slightly widened stock 15 inch wheels and in the rear widened stock (split) 16 inch wheels. 6.5 instead of 3.0 inches wide... If you look closely you can also see the double fuellines for the Fuel injection. Last edited by Hebster52; August 8th, 2006 at 08:39 PM. Last edited by Hebster52; August 8th, 2006 at 08:40 PM. And a peak into my garage after the body and chassie joined together. Last edited by Hebster52; August 8th, 2006 at 08:41 PM. Not much but here is the cut up Split W-decklid pre-fitted. Cuttin' up splits you know!! I have also started to work on sheetmetal gloveboxes. I do have an original pair in cardboard and cloth too, but I think the pre-49 look is much cooler. Therefore I have also been searching for a black bakelite dashpod with black knobs. I was lucky to find one on Bug Run 2005 and also a source for the rest of the knobs in black for a reasonable price!!! Now I've edited the stuff that got messed up we moved to the new board. I am now waiting for some Porsche 944 stuff for the brakes and suspension for it. I'm also buying a 1969 Porsche 911 2,0 boxersix to dump into the rear. Last edited by Hebster52; September 19th, 2006 at 05:26 AM. Some parts that I have been collecting for the Hebster during the past year. Looks kind of weird?? Huh? So, here is what I did today. Here is when I did the rear quarterwindow section right. Rearwindow and roof should be finished tomorrow. Can I have it when he out grows it???????????? I also am pondering wether I should mount the bughead in the rear sticking outunder the reardecklid or in the front sticking out of the front 1/4 panels... Just for looks.. Yes, I will most certainly go with the split. Now, How do I make this fit?!?!? Also started to make the split pillar parts..